With large youth demographics, increasing digital literacy and mobile users across India, the Indian e-commerce sector has seen a boom no industry has ever witnessed. Current estimation of India’s e-commerce sector is around $25 billion dollars which are expected to grow to $200 billion over the next 10. The e-commerce growth has not only affected the businesses by giving them a virtual space for selling products online and create more avenues for revenue but also led to the creation of a number of job opportunities and eased out lives of modern day consumers. With so many groups getting affected with the introduction of electronic commerce in India, thus the need for clearly laid-down rules apart from the existing norms and regulations to cover all online retailers was felt. The union government wants to create a national e-commerce policy to bring all the laws dealing with different aspects of the sector, thus a draft of e-commerce policy line with the recommendations made by the Sri Krishna committee adding new regulations to the e-commerce sector was made public recently. The draft has, however, policy drew a lot of criticism as well as appraisal from different interest groups. After the domestic retail stores have opposed deep discounts by online giants, and small retailers have complained footfall dropping because of the online discounts and big sales. The draft e-commerce policy recommends elimination of heavy discounts levied by online e-commerce giants such as Flipkart and Amazon which is likely to disappoint online consumers if this policy comes into force. The second recommendation in the draft e-commerce policy appears to be of the inventory, this comes with a condition that the e-tailer sells 100% Made-in-India products that is control of such firms will remain with Indians. If this were to happen, it would come as a huge blow to the foreign players. 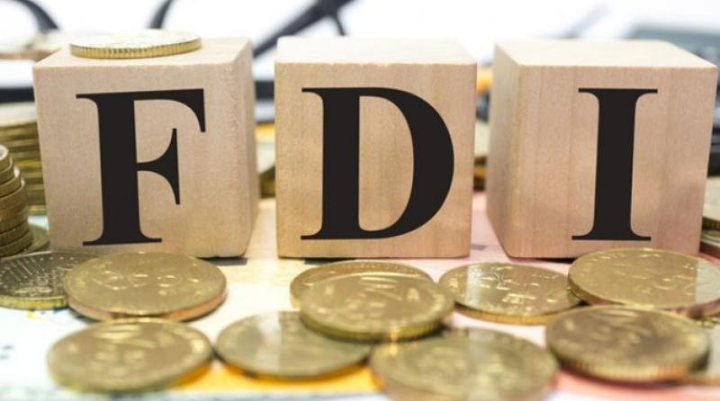 As this rule specifies, the foreign players may only be able to run marketplaces in India, that is, they may not have large warehouses with full inventories. While the several e-commerce companies were hoping that the government would allow a hybrid model of own inventory + third party items, the draft policy is going against the idea. Online giants like Amazon has been working around this problem with ghost companies that hold inventory for the main retailer. With the implication of European Union’s General Data Protection Regulation (GDPR) law that came into force on May 25th 2018 which mandates the online platforms to store their user data locally, the Indian government has started making move in the same direction. Considering data privacy and security as the utmost priority, the e-commerce draft policy mandates the e-commerce companies to store user data in India within two years. Another suggestion in the policy that the data stored by the foreign players be shared with the government under certain circumstances. Since India does not have a privacy-related law as yet, this can become a PR issue with many foreign companies. Technology giants like Google, Apple, Facebook and Amazon may lobby the government to ensure that they get as lenient a space as possible. The Competition Commission of India has been asked to undertake greater regulatory scrutiny and mandatorily examine the mergers and acquisitions of e-commerce. This becomes significant after the recent acquisition of Flipkart by US retail major Walmart. For a better understanding of future financial flows, the government wants to promote the use of RuPay. Visa and MasterCard card networks control the major share of payment network in India and having a domestic card network will help the government in the better implementation of its economic and social initiatives and act as a driving factor to extend banking support to the vast unbanked segments in India, especially in the rural areas. How India reviews the E-commerce Draft Policy? Though there are a lot of challenges associated with the introduction of a national e-commerce policy, but at the same time, it is focused for promoting local businesses, local employment increase and ensuring that our GDP and tax collection improves. In long run, this is going to support the Make in India initiative. Having a regulator (Central Consumer Protection Authority (CCPA)), e-consumer courts may better address complaints about online financial frauds. It will help many MSMEs to go online and large companies to build a viable business rather than just depending on discounts. The Chinese, for example, have successfully ensured that the local strong player emerges by making impossible rules to follow for foreign or by altogether banning them. India may not go down such a strict path, but they seem to be tightening the screws for the foreign players now. 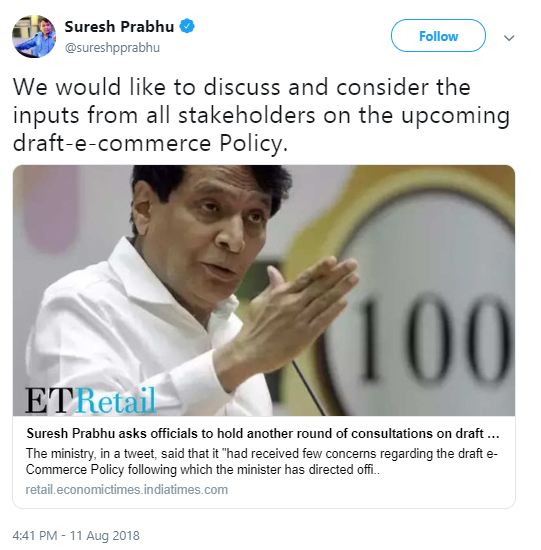 Though the initial draft e-commerce policy has received pushback, including a proposal on foreign investment in some areas and one requiring Indian consumer data to be held locally, Commerce minister Suresh Prabhu tweeted on 11 August that his ministry had received a “few concerns” on the draft e-commerce policy and will reach out to stakeholders to address them. Till the draft is being reviewed, do let us know your views on, “How National E-commerce Policy is going to affect you and other e-commerce business in India?” in the comments section below.